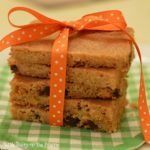 Cake Mix Butterscotch Cookie Bars are my lifesaver, quick and easy, “mom I need two dozen cookies tonight” cookie recipe! They only take a few minutes to make, and I bet you already have all the ingredients in your pantry and your fridge! They’re chewy, moist, and incredibly addicting! If you have kids you know exactly what I’m talking about don’t you! How many times have the little rugrats told you at the very last minute they need at least two dozen cookies in about an hour. Apparentley they signed up for it a few weeks ago and simply forgot to mention it to you. I know, I know, I should make them suffer the consequences of their own choices and either send them without cookies, or let them make the cookies themselves. There’s two problems with that. First of all, my kids are absolute disasters in the kitchen, and I don’t really feel like getting after them until they clean up the mess. I know, I know…consequenses. I get it! Secondly, my kids are usually outside working on the farm and don’t really have time to whip up cookies. They’re legit busy. And that’s when recipes like No Bake Peanut Butter Pretzel Cookies, 20 Minute Christmas Crack, and Classic Chocolate Peanut Butter No Bake Cookies come into play. 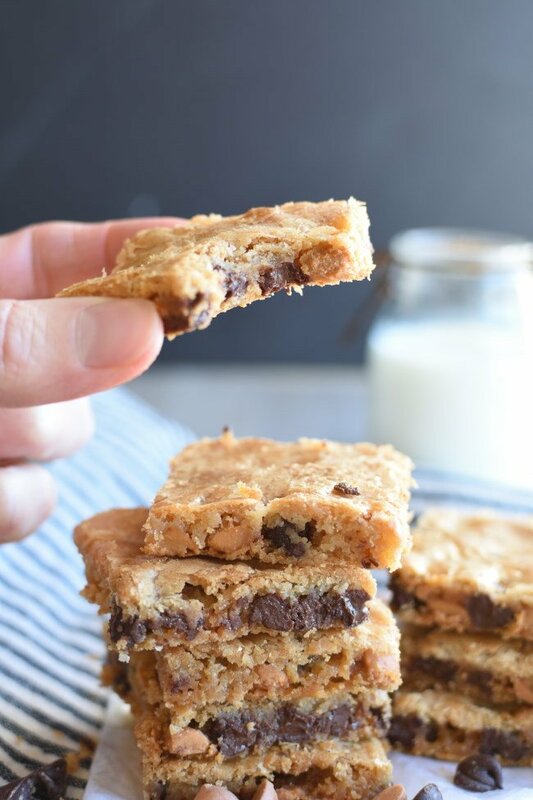 Those recipes are just as awesome and easy as Cake Mix Butterscotch Cookie Bars, except these ones taste like the real deal homemade chocolate chip cookies though! Bar cookies and I have a love hate relationship. They’re so quick and easy, and usually so dry and dense. I’m not a fan of dry dense cookies! Like I won’t even waste my calories on them. 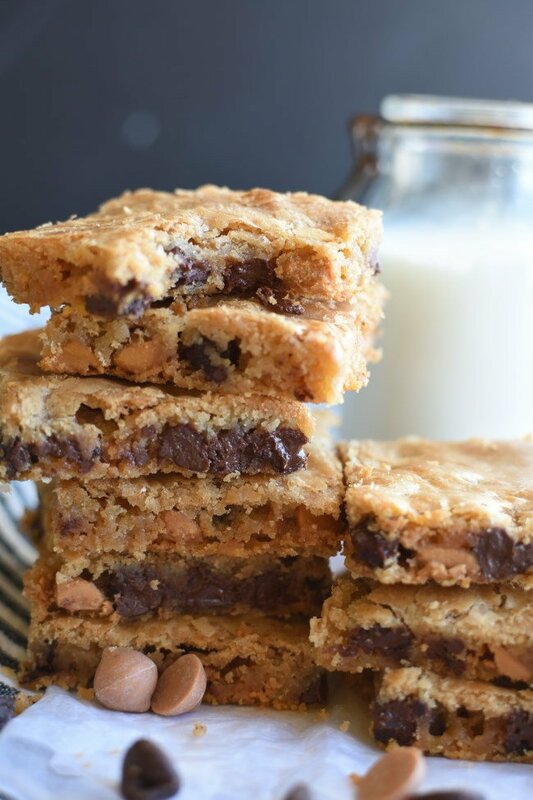 These cookies…they are incredibly moist, perfectly chewy, and loaded, I mean LOADED with chocolate and butterscotch chips! 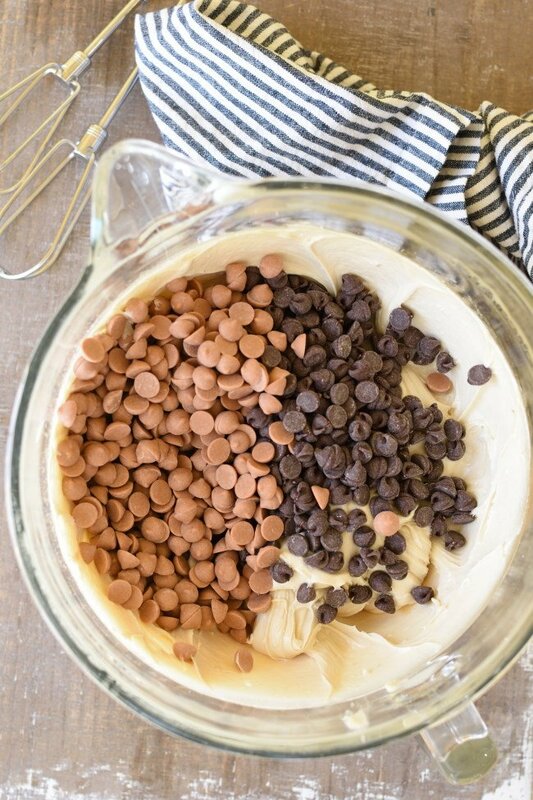 What’s a cookie without chocolate chips? 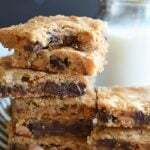 What ingredients do I need to make cake mix cookies? Only a handful! How does that sound? You’ll need melted butter, a cake mix, eggs, and brown sugar. Mix this all together. Did I mention this is a one bowl cookie recipe? Add ALL those butterscotch and chocolate chips I was bragging about! And give it a stir until they’re all mixed in. Spread it out on a rimmed baking sheet. It’s going to be thin. Not to worry! By the way, I should probably tell you the worst part about these cookies. The dough really isn’t all that great. Like I’m not even tempted to eat it at all! I guess maybe that’s a good thing…Nah not a good thing! Just be patient. It all works out in the end. Watch them close when they’ve almost finished baking. You definitely don’t want to overbake these cookies or they won’t be moist and chewy. If anything error on the side of underbaked! They’ll be golden brown and perfect! 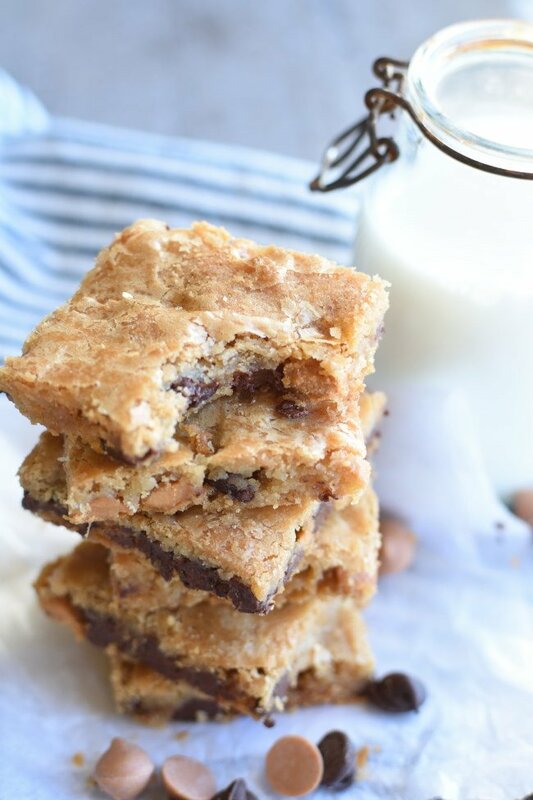 Serve Cake Mix Butterscotch Cookie Bars with a glass of ice cold milk! I’m not even kidding here! 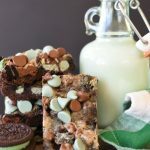 These cookies and milk were meant to be together! When Carson was a little boy he affectionately named these cookies “Row Cookies”. They are Row Cookies because he never ate them one single sized cookie at a time. He cut an entire row in one massive, long cookie and ate it just like that. Well, he actually ate several rows of cookies just like that! 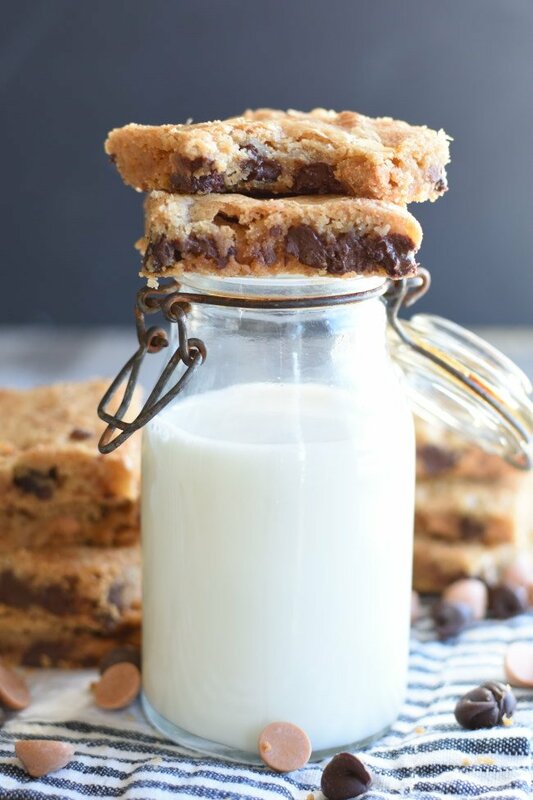 Let’s look at the bright side, when your cookie is a rectangle about 2″ x 10″ you can dunk it clear to the bottom of your milk glass! 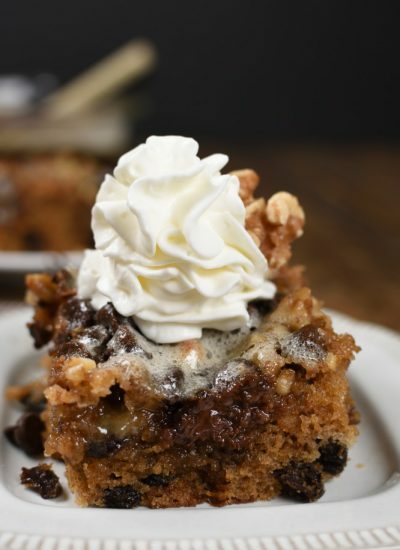 Grab the Cake Mix Butterscotch Cookie Bar recipe! Even if I had all day to dink around in the kitchen, I’d choose these cookies! They really are one of the best cookies EVER! And that’s really saying something because I’m a bit of a cookie snot. They are seriously so moist inside and have almost this crystalized crust on top! It’s good guys…really good! Make them soon and let me know how you like ’em! 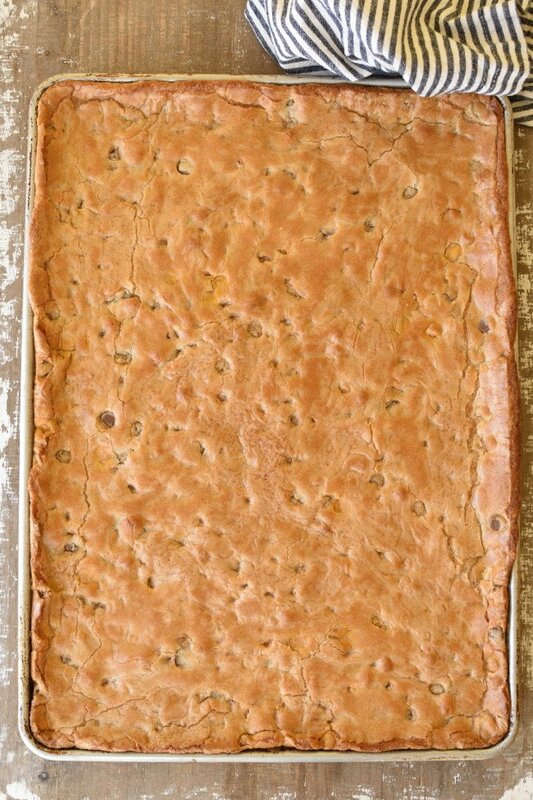 Cake Mix Butterscotch Cookie Bars are my lifesaver, quick and easy, "mom I need two dozen cookies tonight" cookie recipe! 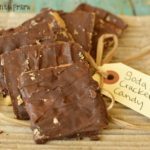 They only take a few minutes to make, and I bet you already have all the ingredients in your pantry and your fridge! They're chewy, moist, and incredibly addicting! Preheat oven to 375 degrees. Grease a rimmed baking sheet. Set aside. Melt butter in a microwave safe mixing bowl. 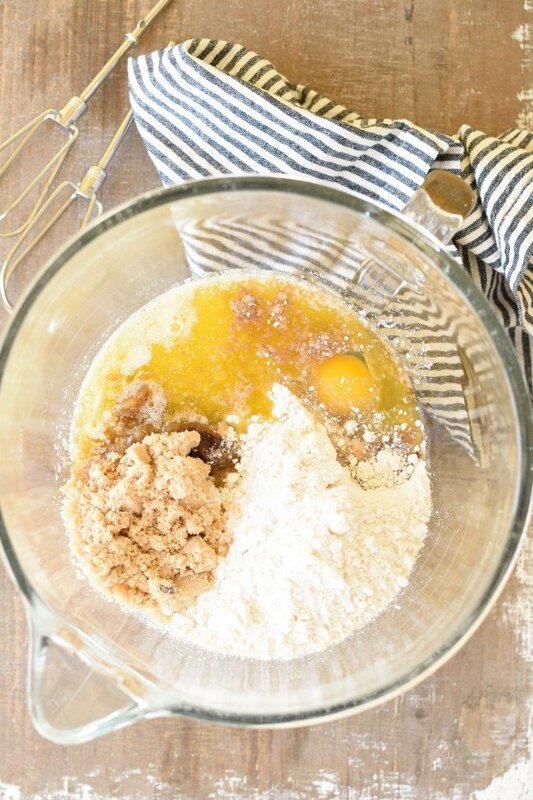 Add cake mix, eggs and brown sugar. Mix until combined. 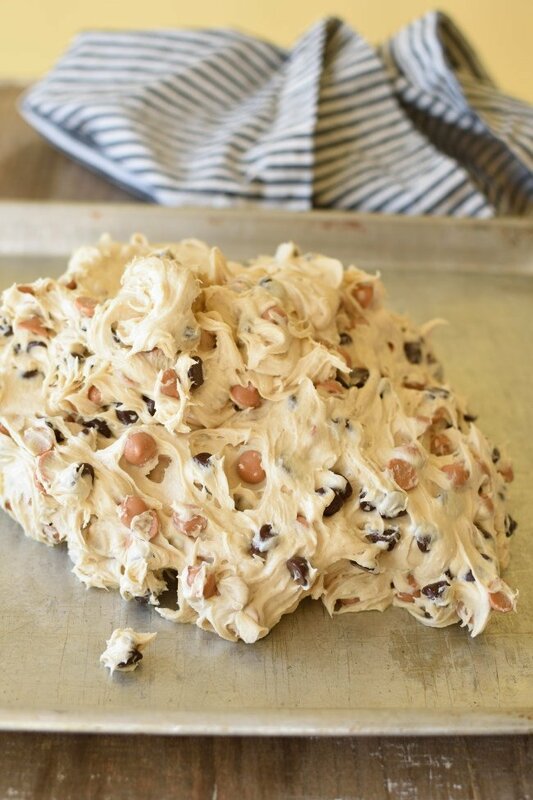 Add chocolate chips and buttersotch chips. Stir until completely incorporated. Spread batter in prepared baking sheet. Bake for 18-20 minutes. Watch carefully the last two minutes of baking. The cookies should be golden brown, but don't overbake! If anything error on the side of underbaked! Cool. Cut in squares. Serve. Store leftovers in an airtight container. You can substitue the butterscotch chips with extra chocolate chips if you'd like. Heck, you can use any kind of chips for that matter! 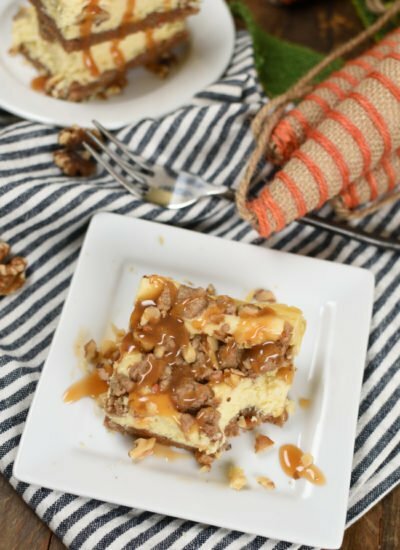 I love that you added butterscotch to these bars! 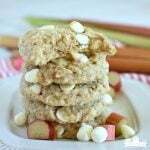 These make such a yummy treat! Thanks! 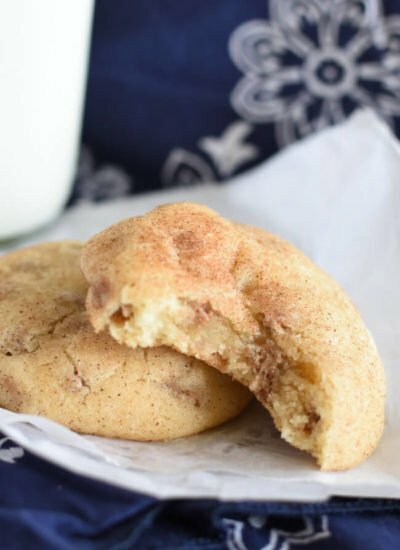 Butterscotch chips make them a little different than the same old same cookies! Those look so delightfully gooey and delicious! They really are gooey! And I’m usually not a huge fan of bar cookies because I feel like they are always a bit dry. Not with these cookies though! These look so delicious! Love how easy they are to make! Easy is my kind of recipe! It has to be when you’ve got a million things on your plate all the time! Right? These look so chewy and delicious! Love the butterscotch flavor! Thank you! They are extra chewy! And yes…if you are a butterscotch fan these are perfect for you! Yum! These would be perfect for a potluck! I bet they’d go fast! These are mouth watering! These would disappear in our house! Disappear is the perfect way to describe what happens to these cookies! It happens much faster than I wish too! Hi Denise! 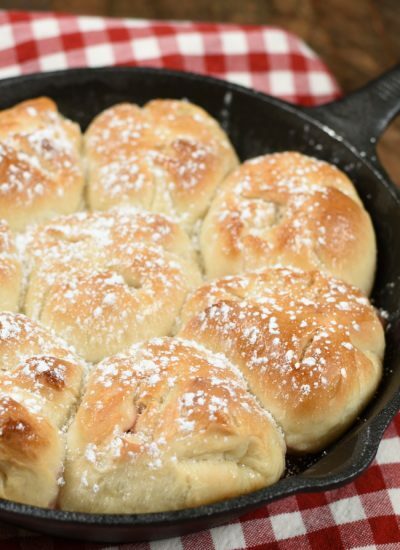 Yes, a standard jelly roll pan! Enjoy! These are calling my name! I love the flavors! Oh my goodness! They call my name, then they call it again, and again! I can really get in trouble with these cookies! Enjoy!